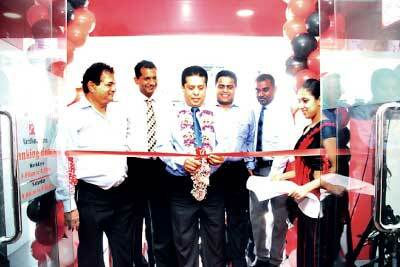 DFCC Vardhana Bank (DVB), Sri Lanka’s fastest growing commercial bank, recently upgraded its extension office which is located at 601/1 High Level Road, Gangodawila into a fully-fledged branch. The ceremonial opening of DVB’s new branch office was attended by DFCC Vardhana Bank Director/Chief Executive Officer Lakshman Silva, DVB’s senior management and staff as well as businessmen and members of the local community. The newly upgraded branch is located in the same premises as the old extension office and will now operate as an independent unit. It has been refurbished into a larger office with a higher operational capacity, which will provide quick and efficient commercial banking services at very high quality to all business and retail customers in the area. The branch will also provide LCs, foreign currency products such as NRFC, RFC and NNRFC and money transferring options via Western Union. DVB also offers the latest technologies with online banking services, a 24/7 call centre and access to over 500 ATMs through its own and partner ATM networks, which allow unlimited withdrawals at zero cost. DFCC Vardhana Bank celebrates 11 years of excellence in the financial services industry this year. The bank remains committed to leading the economy with financial inclusivity while spreading warmth, fellowship and stability in the local community.